Lucien Campeau, S.I. — Monumenta Novae Franciae Volume II: Établissement à Québec (1616-1634). Kevin O'Neill — Famine and Farm in Pre-Famine Ireland. The Parish of Killeshandra. GAIL LEE BERNSTEIN — Haruko' s World: A Japanese Woman and Her Community. | ROBERT B. MARKS — Rural Revolution in South China: Peasants and the Making of History in Haifeng County, 1570-1930. MARCEL TRUDEL — Histoire de la Nouvelle-France. III — La seigneurie des Cent-Associés. II — La société. GEORGE WEISZ — The Emergence of Modern Universities in France, 1863-1914. BRYAN PALMER — Working Class Experience. 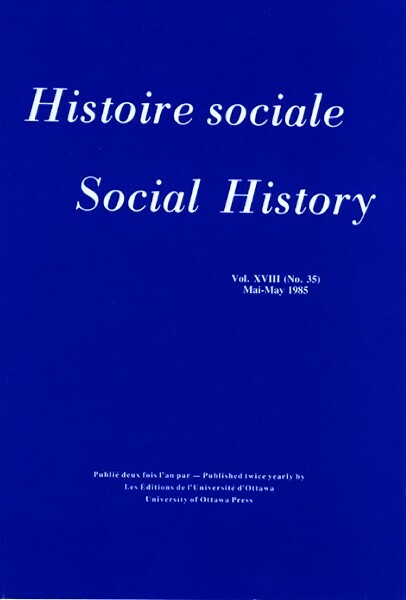 The Rise and Reconstitution of Canadian Labour, 1800-1980. CAROLYN STEEDMAN — Policing the Victorian Community: The Formation of English Provincial Police Forces, 1856-80. JUDITH FINGARD — Jack in Port: Sailortowns of Eastern Canada. GREGORY S. KEALEY and BRYAN D. PALMER — Dreaming of What Might Be: The Knights of Labor in Ontario, 1880-1900. ROGER PRICE — The Modernization of Rural France. Communications Networks and Agricultural Market Structures in Nineteenth-Century France. GEORGE K. BEHLMER — Child Abuse and Moral Reform in England, 1870-1908. | MARJORIE CRUICKSHANK — Children and Industry: Child Health and Welfare in North-West Textile Towns During the Nineteenth Century. JAMES T. MOORE — Indian and Jesuit: A Seventeenth-Century Encounter. HENRY GROSS HANS — Hitler and the Artists. PETER WAITE, SANDRA OXNER and THOMAS BARNES — Law in a Colonial Society: The Nova Scotian Experience. SEAN WILENTZ — Chants Democratic: New York City and the Rise of the American Working Class, 1788-1850. MARIDA HOLLOS and BELA C. MADAY, eds. — New Hungarian Peasants: An East Central European Experience with Collectivization. PETER CLARK — The English Alehouse: A Social History, 1200-1830. DONALD SUTHERLAND — The Chouans: The Social Origins of Popular Counter-Revolution in Upper Brittany, 1770-1796. MORRIS SLAVIN — The French Revolution in Miniature. Section Droits-de-L'Homme, 1789-1795. PETER GAY — The Bourgeois Experience. Victoria to Freud. Vol. 1. Education of the Senses. BRUCE G. WILSON — The Enterprises of Robert Hamilton: A Study of Wealth and Influence in Early Upper Canada, 1776-1812. RIANNE MAHON — The Politics of Industrial Restructuring: Canadian Textiles. BARNETT SINGER — Village Notables in Nineteenth-Century France: Priests, Mayors, Schoolmasters. RACHEL G. FUCHS — Abandoned Children. Foundlings and Child Welfare in Nineteenth-Century France. A.J.B. JOHNSTON — Religion in Life at Louisbourg, 1713-1758. ARTHUR COCKERILL — Sons of the Brave: The Story of Boy Soldiers. A Woman's Life in the Court of the Sun King: The Letters of Liselotte von der Pfalz, 1652-1720. GEORGE HUPPERT — Public Schools in Renaissance France. JEAN BARMAN — Growing Up British in British Columbia: Boys in Private School. FRANCES HENRY — Victims and Neighbors: Small Town in Nazi Germany Remembered. SUSAN GOAG BELL and KAREN OFFEN, eds. — Women, the Family and Freedom: The Debate in Documents. Volume I: 1750-1880. Volume II: 1880-1950. LINDA L. CLARK — Schooling the Daughters of Marianne.